Petite Taqueria is a Tex-Mex restaurant located on La Cienega in the former Bagatelle space. The last time I was at the space, I was bombarded by white walls, white furniture, people sitting on top of each other, horrible service and even worse food. But thankfully Bagatelle is gone and Petit Taqueria, owned by the h.wood group, has opened in its place. The low-lit space has a romantic modern feel. The walls are covered with framed photos and the space consists of rich dark wood tones, velvety booths, candlelit tables, wrought iron fixtures and just barely enough light to see your way through. Past the bar and main dining room and up a few steps sits a u-shaped sushi bar with ten seats around it. This is Ainoko, a separate concept within Petite Taqueria. 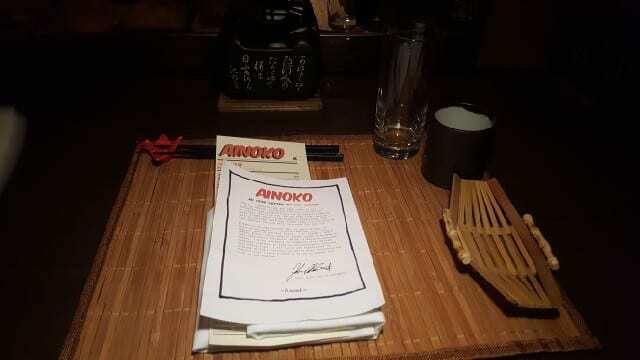 Ainoko, which means “half breed” in Japanese, is the vision of Chef John-Carlos Kuramoto. Chef Kuramoto was raised in the San Gabriel Valley to one parent who is Japanese and one parent who is Mexican. 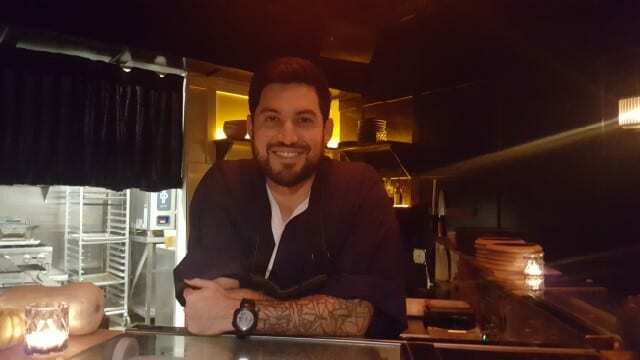 It was growing up with these two antithetical cuisines, as well as other influences throughout his career, that Chef Kuramoto envisioned an omakase menu that blends the two cuisines. A handwritten menu is presented, along with a warm lemon and eucalyptus towel. 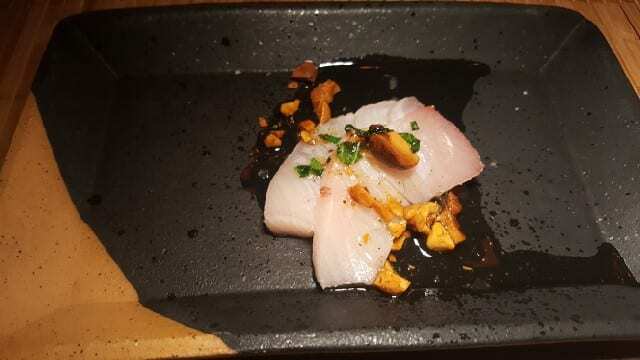 It is not typical to receive the omakase menu before the meal starts and I liked having the menu in front of me to get an idea of what was ahead. But I did not study it for too long as I preferred to hear the chef’s description and then refer to the menu as I enjoyed the dish. 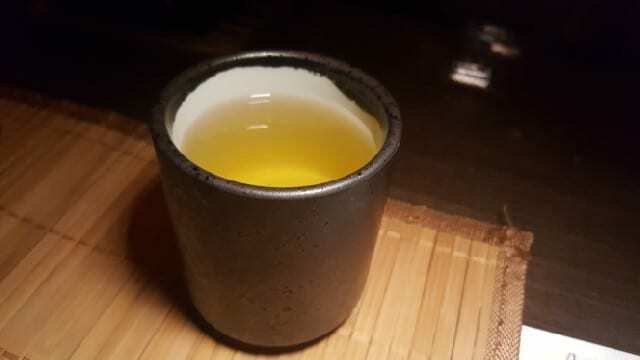 We began with a warm cup of Mandarin Silk tea, an oolong fusion tea that is creamy but delicate with citrus notes. 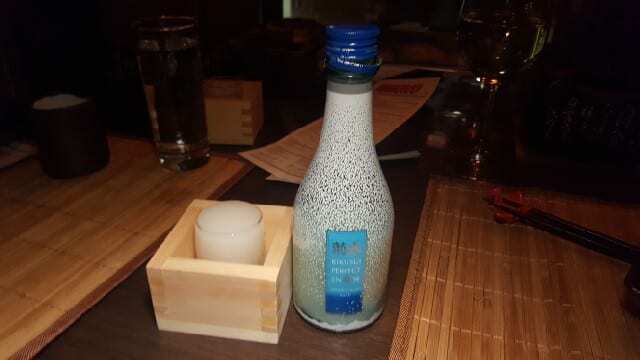 While we had access to the full cocktail list from Petite Taqueria, my friend opted for a selection from the Sake list and ordered the Kikusui Perfect Snow Nigori, an unflitered sake with creamy and citrus notes. I opted for the wine list, which aptly features wines from Baja California and South America. 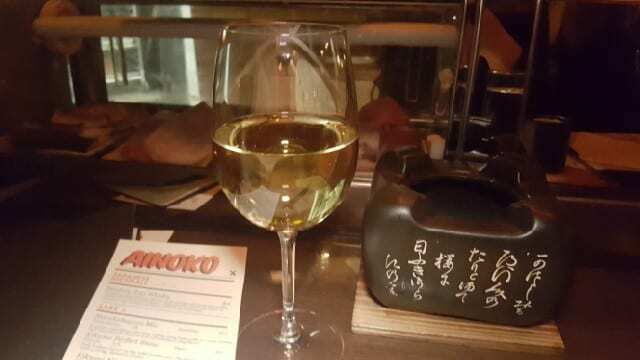 I chose the Casa Magoni Chardonnay-Vermentino from Baja, a lovely wine I was familiar with having met Camillo Magoni on a trip to Baja last year. 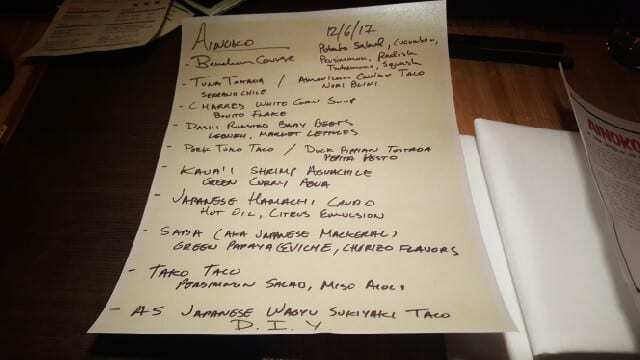 The omakase menu is ten courses (before dessert) and Chef Kuramoto might throw in an additional course or two. 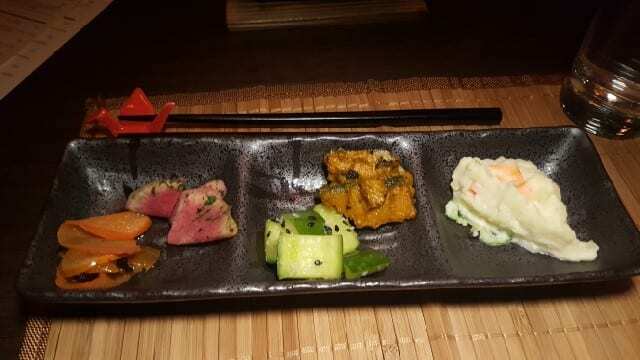 The meal starts with the Banchan Course which included pickled persimmon and radish tsukemono, sweet and tart cucumber sunomono, roasted kabocha, creamy Tokyo Potato Salad. 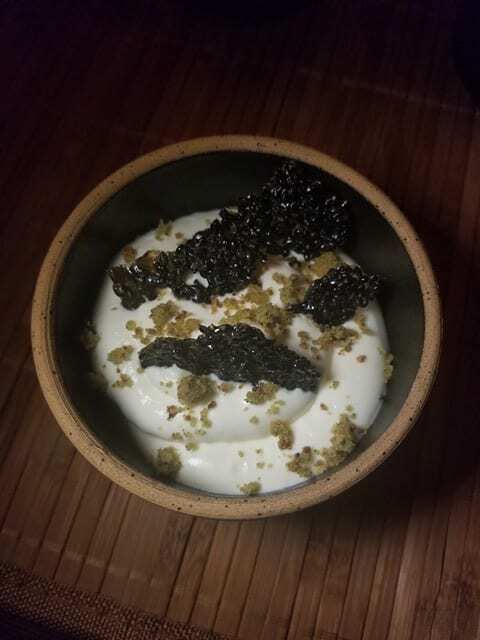 The next dish was an American caviar taco, a nori blini topped with creme fraiche, smoked caviar and lemon. 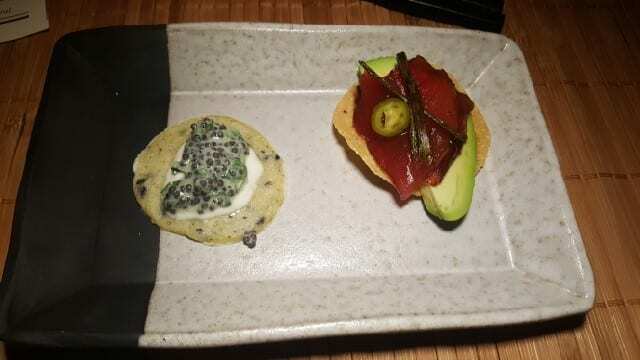 Next to the caviar taco was a tuna tostada with avocado and serrano chile, a fusion of Mexican and Japanese flavors. 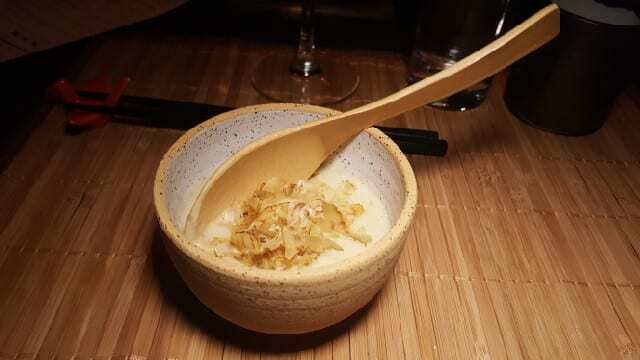 The charred white corn soup with corn broth dashi was served warm and topped with bonito flakes and served with a large wooden spoon. 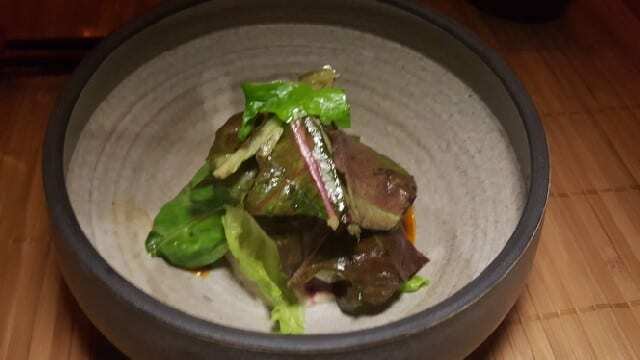 A bowl of dashi roasted baby beets were served with nori and lemon infused lebneh, seabeans and togarashi peanut aillade and topped with fresh greens. 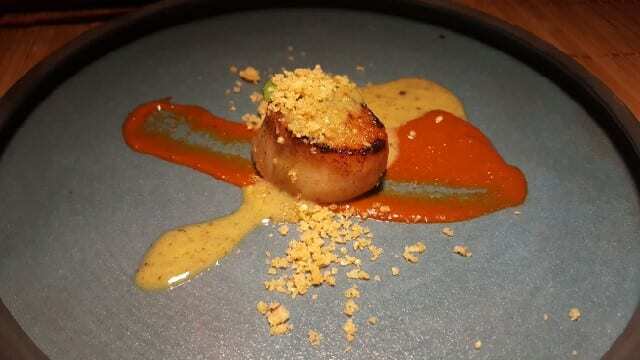 Chef then added an course with a Hokaida scallop seared in brown butter and served with garlicky guajillo and epazote beurre blanc. I can never say no to a dish with brown butter or beurre blanc and this one had both. This dish was a combination of Mexican and French flavors and they really worked so well together. 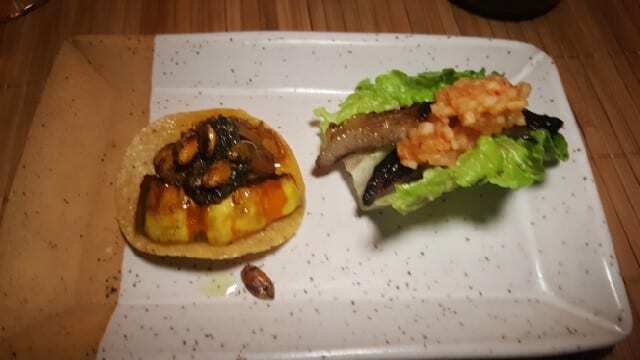 The duck pippian tostada with pepita pesto was a lovely bite with a sweet note and it was served with a pork toro (yes the belly fat) taco. 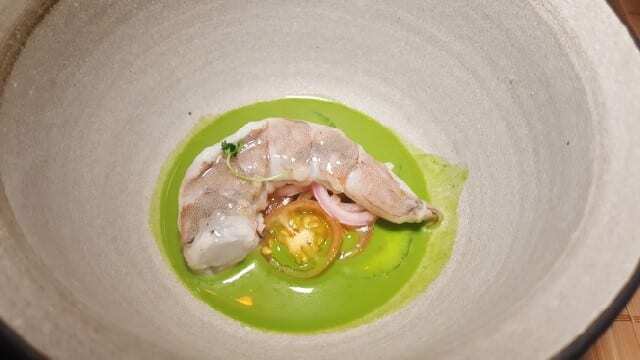 Although it was dark in the restaurant, my handy little light showcased this colorful dish of a fresh Kauai shrimp aguachile served on top of a bright green curry agua and served with sliced tomato, cucumber and pickled onion. The Japanese Hamachi crudo was drizzled with hot oil and citrus emulsion and topped with crushed peanuts togarashi. The combination of citrus and spice did not overpower the delicate fish. 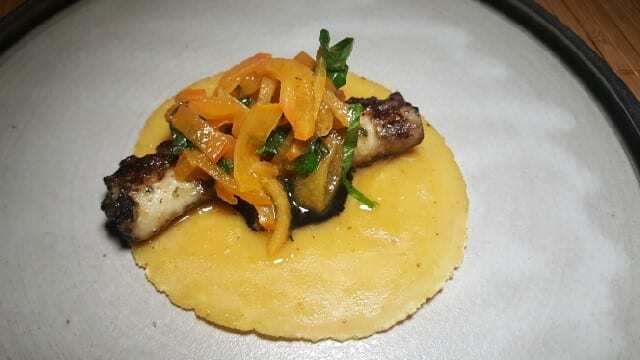 A favorite of the night was the tako taco, a grilled octopus tentacle on a soft homemade corn tortilla and topped with persimmon salad and miso aioli. 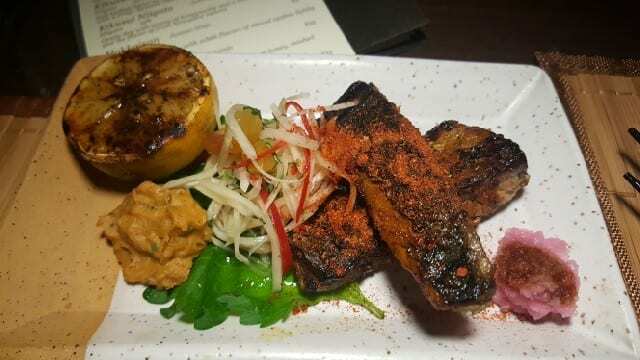 We then enjoyed saba (Japanese mackerel) with green papaya ceviche and chorizo flavors. Our last course was a D.I.Y. dish. 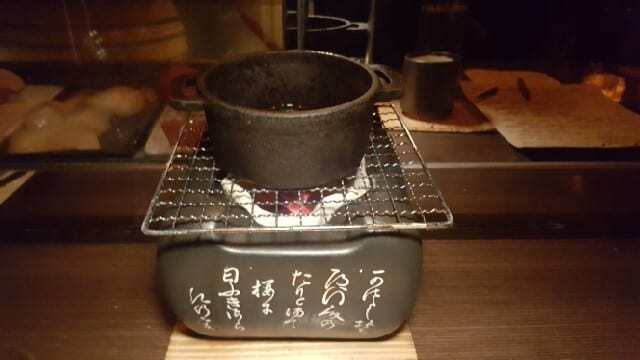 A hot clay pot filled with sukiyaki broth was placed in front of us. We dipped our A5 Japanese Wagyu in the sukiyaki and then made a taco adding caramelized onions and kabocha puree. 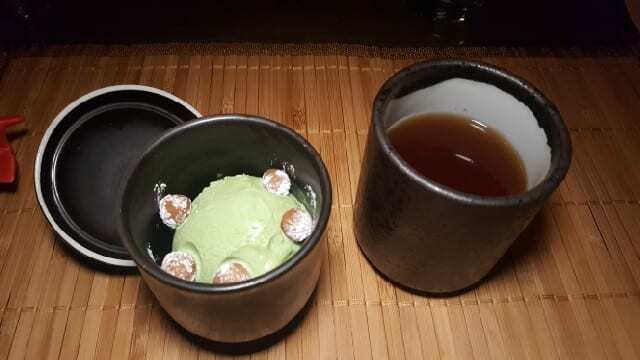 Japanese green tea ice cream with tofu vanilla mochi balls that tasted like churros was served with a cup of chocolaty, spicy Aztec Spice Tea. I was completely stuffed at this point and the green tea ice cream was the perfect dessert, but alas, it was a “palate cleanser.” Our final course was a butterscotch budino with yogurt sabayon, green tea sugar cookie and black sesame candy. This ten++ course menu is $85 plus tax and gratuity. 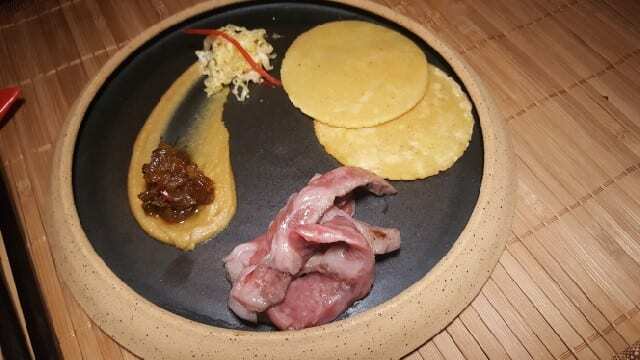 Each bite was beautifully presented and the balance of Japanese and Mexican flavors and combination of textures made the omakase menu at Ainoko a dining experience that pleased the palate! 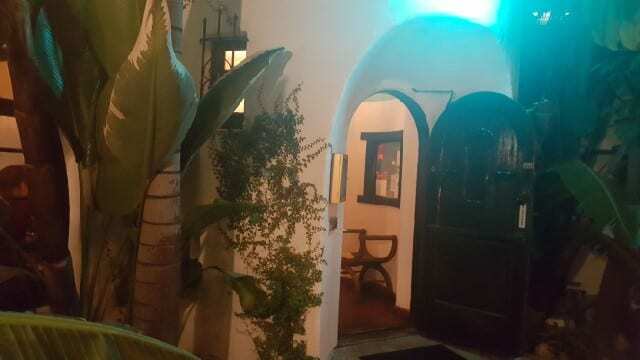 Tucked behind a medical spa on Riverside Blvd in Toluca Lake is an old Spanish-style house that has been converted into Cascabel Restaurant. If you are driving down the street, you will not notice this restaurant but it is a special little find in Toluca Lake.